MediMiss anti aging Anti-aging moisturizersu Skin Care skin lightening skin whitening Skin Whitening Cream Do You Really Need a Night Cream? While our mother went to bed with freshly scrubbed faces, many of us now use night creams that come packed with everything from antioxidants and natural plant extracts to synthetic lipids and vitamins for radiant, youthful looking skin (read: remove wrinkles, fine lines, blemishes, sagging skin). But do these creams really work, or are they just a conspiracy to get use buy another product with no proven benefits? After all, shouldn't your skin be allowed to "recover" after a day's worth of skincare and make-up products? According to experts, using a night cream can actually help your skin recover faster. The key is that night and day creams do different jobs. Night creams stimulate cell renewal and restore elasticity, while day cream protect skin from the ageing, darkening and damaging effects of pollution and the sun's UV rays. Both creams are formulated to keep skin moisturized, but night creams are more likely to be richer, with more anti-ageing and moisturizing ingredients. Different biological processes happen when you are awake and when you are asleep. In the day, your body is bust using up its resources. But at night, your body seizes the chance to repair and restore itself. This applies to your skin as well. Studies also show that your skin losses more water at night, and this drying effect is worse if you sleep with air-conditioning. 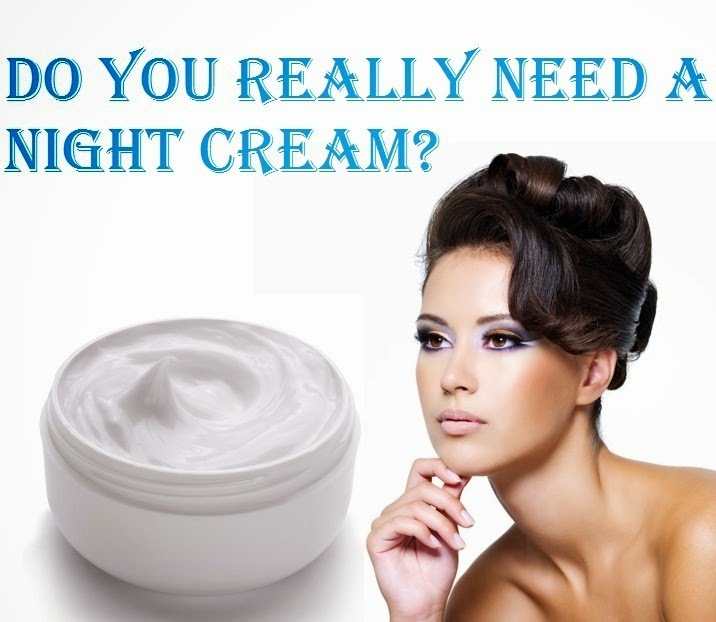 That is why night creams tined to be more moisturizing to prevent dehydration and premature wrinkling. Your skin's ability to absorb the active ingredients peaks at around 1 am, when skin cell production more than doubles. So, in theory, applying a skincare treatment via a night cream allows your skin to absorb more of the active ingredients when it is most receptive. If you are keen on anti-ageing or whitening skincare, night creams are worth trying as they contain a higher concentration of antioxidants and whitening ingredients than day cream. This is because there is no need to include UV protection since it is used at night, which means scientists can stuff in higher concentrations of anti-ageing or whitening ingredients. The night cream you selected depends on your skin type. For instance, if you have oily skin that is prone to blackheads and blemishes, a hydrating but oil-free formula is a good choice. On the other hand, dry skin tends to suffer from fine lines and wrinkles, so it will benefit from a richer night cream. Meanwhile, if you have sensitive skin, go for a hypoallergenic formula with ingredients that strengthen the skin and the tiny blood capillaries. Consider a light but moisturizing night cream. It will help prevent breakouts and blemishes, since skin that isn't moisturized tends to produce more oil to protect from the sun. Ingredients such as alpha or beta hydroxy acids, which help exfoliate skin and make it look brighter; antioxidants such as vitamin A, C and E aid cell repair and protect skin from pollutants; botanicals such as aloe vera, chamomile and sea algae soothe and moisture; non-oily, non-comedogenic or non-acnegenic formulas don't clog the pores. This luxurious cream contains hydroxyproline to stimulate collagen formation, and glycosyl hesperidin to strengthen blood vessel walls. Fortified with ginger, vitamin A, cherry, bilberry extracts, this cream helps protect skin's radiance and prevents sagging and wrinkles. Together with a bio-relaxing complex, this cell-booster corrects wrinkles and helps skin renew itself. Laugh lines are showing up around the forehead, eyes and mouth. Skin is prone to dryness, and may suffer from sallowness, especially since skin cell renewal is slowing down. Products with anti-ageing and anti-sagging ingredients such as retinol, panthenol and copper result in collagen production and renewal; antioxidants and lipids boost skin's moisture absorption; oil-free products help to avoid breakouts; astringent-free products prevents dehydration. Crammed with four times more SK-II Pitera, the brand's signature yeast extract ingredient smoothens dry skin, fine lines and wrinkles. It comes with the brand's patented Nanosome technology which carries Pro-Retinol. A deeper into skin to correct and smooth away fine lines. It's also enriched with Dermalastyl.R vegetable proteins from pea extract. This cream gently sloughs off dead cells and helps skin maintain an optimal skin hydration level with its patented hydro-trap technology. Those laugh lines have become deeper, while skin starts to sag. With oestrogen levels fluctuating, your skin can become dry and may even suffer from breakouts. Moisturizing is now your top priority. Ingredients such as soy, wheat germ, wheat protein and honey help skin retain water, making it appear firm and plump; glycolic acid helps get rid of dead cells and impurities; plant-based emollients such as shea butter and apricot kernel oil up the moisturizing effect; cell-repairing antioxidants to help skin renew itself at night. Loaded with active purifying ingredients, this rich penetrating cream leaves skin looking clear and feeling light. One of the newest anti-ageing treatments in Singapore, the star ingredient is the Enhancing Complex, which has a white willow extract loaded with polyphenols to restore skin to its optimum condition. Olay's exclusive Amino Peptide Complex regenerate skin's appearance with pentapeptide, a strand of amino acid which reduces wrinkles; vitamin B3, which enhances exfoliation; and green tea extract to fight free radicals.